What a treat! Karen imparts 35 years of wisdom — yes, that's right thirty five years — to all of us during this session of TAC. She has one foot in the corporate/meetings world and the other in leisure travel. This means she is one heckuva agent to chat with! Join us as Karen shares her tips on finding the best deal for your client's meetings, discusses why she believes in proactively price matching for her leisure clients, and the conferences and educational opportunities she loves to attend to get her learning on. By the end of the show, it will be no secret why she has so many fandabulous reviews on her Facebook page! What is the GDS? [9:39] For agents wondering what the heck the GDS is and want to take a peek at what it looks like ... and learn why the GDS isn't for every agent. Cvent [29:20]: Karen's must-have software for finding the best meeting venue for her clients. What's a Debit Memo from the Airlines? [32:30]: Mistakes in the GDS can lead to an agency receiving a debit memo from the airline. Learn how much they cost and what in the world they are. Public Library Free B2B Leads [32:50]: Karen shared the secret that your local public library is a great source for B2B leads. Here's where to look. Hurlbut Travel FB Page [42:06]: Read the 12 glowing five-star reviews Karen unknowingly received on her FB page! Travel Planners International [44:00]: Learn more about Karen's host agency. Travel Weekly's Global Travel Marketplace (GTM) [45:15]: Travel Weekly's flagship conference for top producing agents to connect with vendors. Best Credit Cards for your Travel Agency: FREE Calculator [51:02]: Don't leave money on the table. Make sure you're getting the most bang for your buck by using HAR's free credit card calculator! Steph: You're listening to Travel Agent Chatter Volume 5. 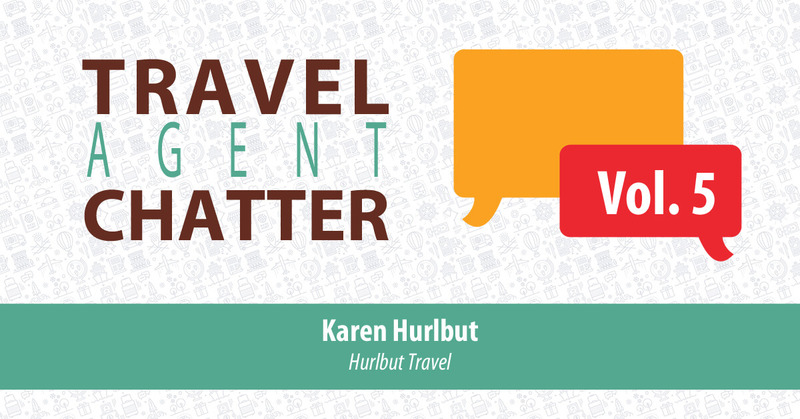 Today, we're talking with Karen Hurlbut with Hurlbut Travel. To all of our first-time listeners, welcome. And of course, to those of you that are back for yet another episode, I am sending you oodles of rainbows and sparkles because I'm so excited to have you join us again. 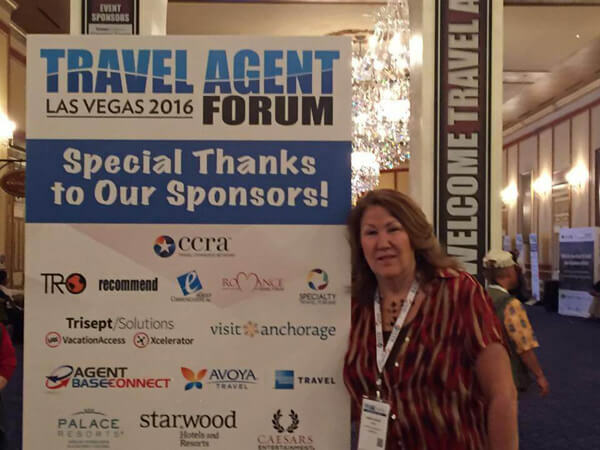 Travel Agent Chatter is an audio series produced by the team here at Host Agency Reviews. You can find a full transcription in our show notes at hostagencyreviews.com\tac. If you like the show, don't forget to stop by iTunes or Stitcher and leave us a review. Thank you to those listeners that have left us a star rating and a special thanks to Molly Butler from Your Travel Butler who said, "Thank you for offering these podcasts. I started my part-time travel business conducting sales as a home-based travel agent in October. The tips from VIP Vacations in episode 4 were amazing, and I hope to use many of them to build my new business. I look forward to listening to the podcast I miss and the ones to come." Well, Molly, thank you for the wonderful review. Welcome to the industry. And I think you'll find even more great tidbits to grow your business from Karen. Now, let's get on to the show. Steph: Well, good morning, good afternoon, and good evening to everyone. Thanks for joining us for another episode of Travel Agent Chatter. This is Steph Lee, the founder of Host Agency Reviews, and I am lucky enough to be your host for today's show. For those of you out there that are aspiring to break into the corporate or meetings market, you'll want to bookmark this episode of TAC. 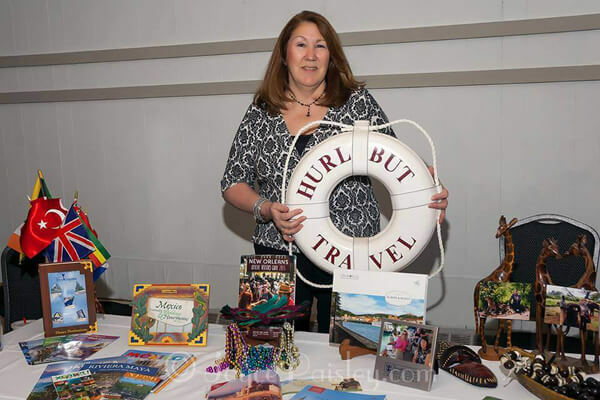 We have Karen Hurlbut, the own owner of Hurlbut Travel with us today who has over 35 years in the business and is killing it on the corporate and leisure side of travel. One thing to mention before we get started is that Karen is incredibly modest this entire time we've been speaking so much in fact that when I first called to interview her, she was positive that our pre-interview call wouldn't last an hour, that she didn't have that much to say even though she has 35 years of experience. And as you can guess, our call did last an hour and I'm here to tell you that not only is she incredibly modest, but after the call, I can tell you that she's also incredibly successful and has a lot of great tips that I'd encourage our listeners to jot down. So on today's show, we'll be talking about breaking into the corporate and meeting side of travel. And Karen also sells leisure travel in addition to corporate travel. So we'll talk about how to balance that, selling leisure along with corporate because they really are two separate animals. And we'll make sure that Karen shares a few of her tips on securing the best rates for your clients' meetings, as well as have her divulge to us how someone with 35 years of experience continues to learn and grow. As usual, I want you to be able to sit back and listen and enjoy the show and not worry about scribbling down notes. So we'll be listing the resources that we chat about during this call as well as a link to the full transcript in our show notes. So how do you find that treasure trove of goodies in our show notes? If you visit hostagencyreviews.com\tac, and you'll click on episode 5 to find the show notes. Now, our itinerary for today's show, we've got five exciting segments for you! The first would be talking about falling into corporate. Next is demystifying meetings. Then we'll talk about balancing corporate and leisure travel, continuing education, and then we'll wrap up with our warm fuzzy segment. So let's settle in for another exciting episode of TAC. We're about to learn some really great tips. Karen, welcome to Travel Agent Chatter. Karen: Well, thank you, Steph. I'm excited to be talking to you, and I hope I have information that helps other agents out there. Steph: You definitely do, and we are so happy that you decided to come on the show and share some of those tips with us. I think on our last episode of Travel Agent Chatter, we broke the record for the most experienced agent. She had 26 years of experience, but I'm happy to tell you that you now hold the title for the most experienced agent we've had on the show. Karen: That just means I'm a dinosaur, Steph. That's all it means. Steph: No, and I say with amazement that...well, for all of you, that Karen has been booking travel for nearly as long as I've been alive which is just like blows my mind, the amount of experience that she has. Karen: Oh, I feel old. Steph: Maybe I'm just really young. Karen: Let's go with that. Steph: She started out in travel in 1983 with no experience and she ended up landing a corporate job. And from there, she's evolved into an agent that owns her own agency which she runs from home and she now has the help of a part-time admin assistant. So let's start by talking about Karen's beginnings, and I'll give all of you a teaser and tell you that her first job involved booking corporate clients on...get this, I kid you not, a spreadsheet. And then she would shuttle the actual paper tickets around to the different offices. Karen, would you mind sharing how you fell into your first corporate job at IVI Travel? 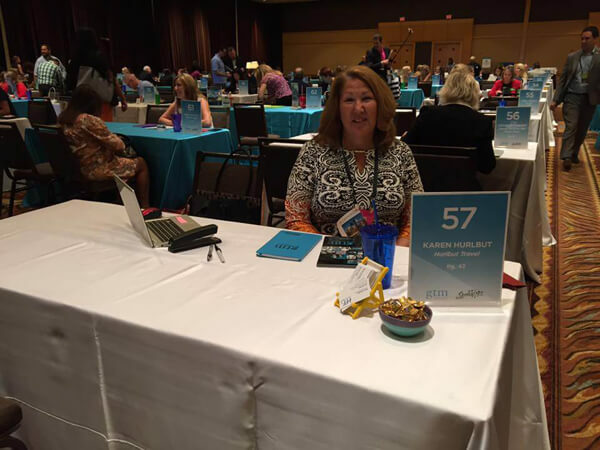 Karen attends trainings and networking events to further her knowledge and industry connections! I did. I mean, the true story is my mother who was living near Chicago called me when I was living near Appleton, Wisconsin because she had talked to someone who worked for Ivi saying, "Oh my gosh, there's a job opening in Appleton. I bet Karen would be good at that." So of course, my mother jumps on the phone, calls me, "Go apply, go apply." And I'm like, "Mom, I'm not a travel agent." She goes, "Go apply. You'll do good at that." So I literally got dressed up and went up to Neenah, Wisconsin, and walked in the door, filled out the application. And she says, "What kind of experience do you have?" And I said, "Not a lick. I have no experience in the travel industry at all, but I will be the hardest worker you've ever hired and I'm willing to learn." And I got hired on the spot and started the following Monday, and that was the beginning of my career. Steph: And so we can get a picture of the path you took from store front to home-based. Walk us through your jobs after Ivi and how you ended up opening your own agency and going home-based. Karen: So after I was with IVI up in Neenah for four years, actually it was three years, and then my husband got a job in the Milwaukee area. So I obviously had to move. Ivi had an account here in near Milwaukee in West Allis for IBM and GE Healthcare. So we moved to that office and I worked there for...actually, it wasn't GE Healthcare, and my apologies. It was IBM. And we worked there for a year and then I found this opportunity through Carlson which it used to be Ask Mr. Foster when I worked for them originally. Then they got bought out by Carlson, and then now I think it's Carlson Wagonlit, but Carlson. So I was inside GE's office through Carlson for almost nine years doing corporate travel, and they moved that whole office out to Phoenix where they were going to do all of GE, not just healthcare. It was going to be their appliances and their healthcare and corporate, everything to do with GE. So I chose to stay married and stay in Wisconsin rather than move to Arizona. Steph: That was very big of you. Karen: That was very good of me. And I ended up working for a local mom-and-pop agency for almost a year. And then we found out we were going to be adoptive parents. So I chose to be home with my children and that was 24 years ago, this past January, and I started up my home business. And that's what led me to a little bit of a leisure life which was very interesting. So I still do corporate with GE Healthcare because I do their customer program, but I also do people's vacations and honeymoons, and corporate meetings that I do for GE, and I also have other corporate clients that I do meeting planning for. Steph: And when you were starting out, which GDS did you start out on? And how in the world did you go about learning it when you knew nothing about travel? Karen: Well, we started out in Neenah on PARS which was a TWA product. And I was the production agent for that office when I first started because obviously, I didn't know how to sell travel. So I would rip down the tickets and prepare them for ARC. Send those off, and then because everything was paper, I got in the car, delivered all the tickets to all the corporate travelers for Kimberly Clark. And when I came back to the office, if there wasn't any tickets on the printer, I went and sat at a terminal and they have training mode. And they have it on all GDSes. They still have it on all GDSes. And you can go into training mode and just, at your pace, learn how to book an airline ticket and how to book a car rental and hotel. And then you keep doing these lessons and you do a lot of learning on your own. And then when they had an opening actually for an agent, they said, "If you would like to do that, that would be great but we're going to send you down to Dallas for a week and do a week of training." And I did that, and I came back, and they put me on the phone. Steph: And you were like, "What in the world?" Karen: Yeah, but that was probably after a year, maybe a year of being a production agent. And at that point, they had switched to Sabre truthfully, so we did the PARS. But they're like, "Oh, one's like another, like another, like another," which from format-wise, there's a little differential, but in general, it's still the same basic formats on all machines. Steph: So what other GDSes are you proficient in because you're not on Sabre anymore? Correct? Karen: No. No. I was on PARS and I was on Sabre, and I was on Apollo. And for the last probably 15, maybe 20 years even, I've been on Amadeus. Steph: Okay. And I know that agents that are in the GDS know that switching between them is similar to learning a classical language in that there are base similarities like you said the formats. But for those listeners that have never worked in the GDS, tell me about the experience of moving between the GDSes. Like how do you do that, because to me, that seems incredibly hard? It's like a programming language. Karen: Well, it is a programming language. It really is. When I have clients sit at my terminal when I'm booking a trip for them, they're like, "Is that DOS?" And I'm like, "Well, I'm sure it's similar to DOS," but it is all programming language and you do have to learn the basics. But once you have one GDS down, they give you literally three pieces of paper and go, "If you wanted to check availability say in Apollo, this is how you do it in Amadeus." Like to price for a PNR in Apollo, you do $BB0. And that tells the computer to price it. And in Amadeus, it's FQD. So obviously, not similar at all, but you just learn. It's all repetition. Everything in corporate is repetition. If you can book one ticket, you can book a million tickets. Over and over and over, you're booking the air, car, hotel, hang up the phone, pick up the next call. It's not as hard as it sounds. Steph: I don't know. Having watched people in the GDS and tried to work in it, not so well. I have a lot of admiration for people that work in the GDS. I think that agents don't get enough credit for learning the GDS. And for those of you listening that are unfamiliar with the GDS and are kind of wondering, "Well, why couldn't I just pick that up?" Because we do have a lot of agents that will write in to us and say like, "I would like to be in the GDS and book airline tickets," but it's not that simple. We'll link to in our show notes an article we have about the GDS, and in there, you'll be able to see there's a little video of what it's like to book in the GDS and you'll be able to see the green-screen side of it although they do now have like the GUI or the graphical user interface or point-and-click side of the GDS systems. And right now, you still prefer the format, the green screen side, correct? Karen: I do. I would not survive in a point-and-click atmosphere. I would not. It's too cumbersome. It's too slow. It requires just too much investment of time. Karen: Not enough oxygen. And all of the GDS agents out there who have been doing it for a long time, I think, they would tell you the same thing. They would rather point a gun than have to point and click. Steph: Yes, I have heard that. I know for new agents, obviously the point-and-click side is easier, but for experienced agents, like all I hear like repeatedly is that the format side is way more flexible and way quicker and it's not just that they feel more comfortable in it, but that they're able to do more probably because it's been evolving for decades versus the point-and-click side hasn't had that long to evolve, and they're working off legacy systems. Karen: I would agree. And when you're doing point-and-click, you're not able to link multiple entries together. So when you're working in just hard formatting, you can link, five, six, seven things together and have them all happen at once rather than clicking seven different buttons. Steph: So tell me more...what do you mean by that, like linking them together? Karen: Well, you can just...it's like an & sign but it's computer language. So you would put in your ticket time limit and you would put in your received from, and you would put in your address field, your phone field. You can put in your name field, and link them all together with, in essence, an & key where you can do all of that at once, enter, and it goes in. Steph: Okay, versus having to point and click and save and go to the next screen. Karen: Correct. So from that point of view, it would be too much time wasted for someone who knows to do it the format way. Steph: Okay. Well, let's kind of move into chatting on your corporate and meeting expertise. So coming from a storefront leisure agency, I'll openly admit that corporate and MICE or meetings, incentives, conferences, and exhibitions, are areas that I'm less knowledgeable about which is why I loved hearing about your experience. So let's start with how you landed your largest corporate client that you have right now. I'm assuming they didn't just call you up looking for an agent. Correct? Karen: They did not hit...my largest corporate...well, I have two corporates. So I do the customer program for GE Healthcare, and that involves flying them into one location, setting up their ground transportation, and their hotel accommodations. And they do a couple...two to three meetings a month that I will fly these people in and that account I got because of the people who knew me when I worked inside GE Healthcare. So after I left after they moved that account to Phoenix and I left, they called me up and said, "Our corporate agency, Carlson out in Phoenix, they're not able to handle our customer program because it's an automated system through Carlson, and it works very well when it's employees, but you're not very willing to ask customers for Social Security Numbers and personal information which is what Carlson required to book tickets." So they called and said, "Do you need that information?" And I'm like, "Absolutely not." And they said, "Well, then you get the job." Karen: It's great. So I've had that for many years. But my other corporate client that I do meetings for, he, I ended up getting introduced to through my cousin who does his graphic design and he was speaking with her one afternoon and was whining and complaining about how hard it is to have all the details taken care of on this meeting because he was doing it all by himself. And she said, "My cousin does that for a living." And he's like, "Really?" So he literally called that afternoon and that was nine years ago. Steph: And is this the gentleman that kind of works in the bank field and does like 10 to 12 meetings a year? Karen: It is. The best way to describe him is as a facilitator to bring bankers and brokers together and discuss best practices. And I used to actually sit in on the meeting rooms and hear them all chit-chatting about the banking world until I got bored to death and asked if I could have a table outside of this meeting room. Steph: Oh, that's so funny. Because you don't just book the meetings for him because when we were talking earlier, you're very involved. You're almost like a hostess. You go to the hotel where it's hosted and you kind of take care of everything he needs. Would you mind explaining your role at the meetings? Karen: Absolutely. So I call it a meeting concierge just because I have no other good title for it, but what I do start to finish is I negotiate his contract. I take care of all the air and the ground transportation, hotel accommodations, dinner reservations. Any entertainment that we do on-site, I take care of all of that, and I'm also there to represent his company as a hostess, is the best name for it I guess. So we have a dinner on the very first night where all of the attendees will come and I greet them and introduce myself and give them a nametag. And if I see that they're kind of hanging out by themselves, I will gently nudge them to be introduced to other people who are attending, and then we take them to dinner and I take care of all the bills that are encountered during the meeting. And so, usually, the last to go because I'm finding the chuck. And then I get up in the morning and I make sure everyone finds the breakfast room and the meeting room, and take care of all the breaks and all the things that are incorporated into a meeting. That's what I do for him. Steph: He must have been so excited when you started taking things over. Karen: Oh gosh, yes. He was exhausted from all of that. Plus, he didn't know what he was missing out on. He would call a hotel and he didn't really know you could negotiate a rate. He didn't know that you could get comps. He didn't know that you could get discounts on food and beverage. So he was losing money by not having an agent represent him. Steph: In terms of compensation, how did you come up with your compensation structure and what is it when you're...? Because when you're working on this meeting, it goes beyond just the booking. You're on location and assisting him in every way. How do you come up with your compensation structure? Karen: Yeah. I came up with it...I mean, I just recently within the last year upped it from 10% of total meeting cost to 15 just because I deserved a raise. But anything that I don't get a commission on is what I charge them on. So when I make an airline reservation, all tickets are $30 fee. That's just a standard fee on all airline tickets. Everything else is a blanket fee of 15%. So if I set up your food and beverage, I get 15% of that. If I set up your dinner reservations, I take 15% of the total. So the more you eat, the more I make. Steph: You're encouraging people like, "Don't you want a dessert? Have another drink." Karen: Exactly. Yeah. And if you look at other companies who are meeting planners like Helms and Briscoe, these companies, they charge outrageous sums of money and then they charge outrageous sums of money to be on site and they're not personable people who are engaging your clientele. They're just people sitting outside your meeting room waiting to be texted that the temperature needs to be changed. It's very impersonal when you work with companies like that. So when you find someone like I have to work with, you have to become a member of their team. It's not just a service, you become part of their family. And it works great. Steph: That's great advice. Now, I know that every one of our listeners would love some tips from you on booking meetings. And you had talked earlier about your negotiations with the event, how this last gentleman didn't know that he could negotiate food and beverage credits or that the room rates were negotiable. And that without an agent to work for him, he was missing out on that. So when you're negotiating an event, what's your progress? What tips do you have for agents? Karen: Well, it's a little time consuming and probably there's a billion people out there who would come up with better ways of doing this, but what I have always done is you look at a few different sources, maybe even up to five, of what the lowest price the hotel is offering for the timeframe you want. So you look at their website. You call the hotel directly. You go on to some tour companies like Funjet or Apple or whoever might sell the hotel property and find out what the lowest rate you can get for the nights that you're looking for. And then you start working with the hotel and they come back and let's say they offer you $300 a night. And you go, "Oh, I thought I saw something online that was less than that. Can you just check and see if there's a better rate?" And let them come back. It's a game of cat and mouse. As sad as that is to say, it's all a game from their perspective and the agent's perspective. They want to get the most out of you and you want to get the least out of them. So it's this pull and tug race of who's going to get the better deal, but you have in your mind what your minimum amount is going to be and you just play back and forth until you get it. And then once you've got it, then you start adding in all the other comps. Go, "Well, okay, I might accept that rate if you give me one free for every 40, and I might accept that rate if you give me four upgrades to a suite. Or I might accept that rate if you give me 10% off your food beverage. And I need like internet in the meeting rooms or comp room in all the sleeping rooms." And depending on what brand of hotel you're working with, that's probably a given for most brands. Most people that are coming to these meetings are well-traveled. They're Marriott members, Sheraton members, Hilton members, whatever it is. So they're probably already getting like free Wi-Fi in the room. So I pick and choose what's important to my client because the attendees are secondary compared to what my client's needs are. So I'm always trying to get my clients the most money back rather than necessarily the attendees. So the free Wi-Fi in the room is not as important as maybe free Wi-Fi in the meeting room, or the 10% off food and beverage, or the free power drop in the room which are kind of standard if you know to ask for them. But if you don't, suddenly, you've got a rebill of $2,000 for them bringing power into your room. And almost every hotel out there will give that for free. Steph: Okay. And then, are there any other things that are typically given for free for meetings? Karen: Yeah. Well, other than the free Wi-Fi, you should be able to get some sort of discount off the food. You figure out what your food and beverage minimum is and you figure it's going to be somewhere around...well, I guess it depends on how well they eat, but $150 to $200 per person per day is an average that you can kind of have in the back of your mind. So if they come back with a food and beverage minimum that is more than that, you have to renegotiate and say, "Look, we're gonna do breakfast, lunch, and two breaks. I don't think I can eat 400 per person per day." And then if they come back and say, "Well, that's the best we can do," then you have to come back and say, "Well, I don't think that's gonna work for me, so you're gonna have to drop your room rate by $40 per person." So you just kind of go back and forth and you should never ever have to pay for meeting space. Companies that come back and say, "The room rental was 1,500," absolutely not. You should never ever pay for meeting space. Steph: And you had also mentioned the points about having your client asking them to double the points or negotiating on that as well. Do you want to expand on that? Karen: Exactly. So if you're with a chain hotel that offers points and there's so many now that Marriott and Sheraton are one huge hotel now, that's where you really have the power. So they say, "Well, we'll give you 25,000 points for your client." And throughout the negotiation, depending on where you are in the process, you can say, "Well, we'll sign the contract if you want to double those points." And there is not one sales manager who's gonna say no to that because it's not really money out of their pocket, it's points out of their pocket. Steph: And when you had mentioned with this particular client that oftentimes you're going to the same destination or to the same hotel, and you had some tricks in your pocket. Like if you're bringing them four groups during the year, kind of how you don't put it all out there at once and you drop one client or one meeting at a time as you're negotiating. Karen: You do. You definitely do. So you start out...and I really should preface this by saying that I really do like when you're going to a new destination that you can use Cvent. They do a great job of narrowing it down. It's free to travel agents, and they will contact, I believe it's up to eight hotels on your behalf and have the sales managers reach out to you and give you their first run at the best rate. So that's if you're not familiar with the area, it's a great place to start. But once you have a location picked out and you've used it, you can go back and say, "I think we're gonna bring another meeting back to you next year, and what's the best you can do?" And you go through that whole nitty-gritty of the negotiation for that one meeting, and then you walk away. And you come back and say, "You know what? I just found out it looks like we're gonna have a second meeting in your area, and now that I'm bringing you all this extra revenue, what can you do now? Is there something better that you can come to a bottom-line? Can you reduce our banquet by 15% instead of 10%?" And then you see what they say and then you walk away. I mean, it's just like negotiations when you're on vacation and you're trying to get a necklace on the beach. You just keep walking away until they come back and go, "Lady, lady, come here." I mean, it's really the same thing and you go back third time and say, "You know what? I just found out he's bringing two more, but now I've got four different meetings walking in your door. Let's talk Turkey." And you just get them down to everything you want maybe a little bit more and your client just thinks you are the best thing since sliced bread. That's the whole point because the client is not thinking he's getting anything better than what he got the last time. And then you go back to him and say, "Look what we've done." And he's like, "Dang. There's a reason I use you." Karen: And that's the whole point. And then he tells his friends, and then suddenly, you've got more meetings. Steph: Yeah, the value of an agent when organizing a meeting because there's already so many details in planning a meeting and presenting at a meeting to have the agent focus on the travel end of things is just invaluable. And I would feel that most people that hired on an agent or worked with an agent on their meeting would never go back to not working with an agent on it. Karen: I know that this particular client would not. Karen: Because now, he's free to do what he is meant to do. He's there to run the meeting. I mean, there's so many other things that he is able to do because he's not thinking about what my job is. He trusts that when I say I'm gonna do something, it's done and he doesn't have to give it a second thought. Steph: Yes. Well, we'll link to Cvent in our show notes for those of you that are listening, but Karen, do you have any advice for agents that are looking to break into a corporate because it is a very difficult niche to break into simply because of you need to know what you're doing and the GDS is something that's not exactly intuitive and expensive when you make mistakes? Karen: Correct. Oh gosh, yes. I mean, there's a couple things that you can do to try and get to know the companies that are in your community. You can be very active in the Chamber of Commerce. Those are all businesses that are part of your community. You can also go to your local public library and I don't know what it's called, Steph, but you can ask the librarian and they can present you with a list of all of the companies that are in your town and you can reach out to them on the phone or email. Or if you want to stop by with a box of muffins and go, "My name is Karen Hurlbut, and I'm an agent in your area, and I would love to do your corporate travel. Is there someone I can talk to?" And it's tough to get in because most of the companies that have traveling salesmen or traveling technicians, whatever it may be, they probably already have something in place. But if you get to know these people within your community, those doors may or may not open up. You can give it your best shot. Steph: What should agents expect? Like say if they went to the library, got a list of companies within the area and reached out to them, what percentage should they expect to even be able to have a conversation with? Karen: I would say for every hundred you knock on the door, you might get one. The sad number, it's a sad number, but don't let that get you down. 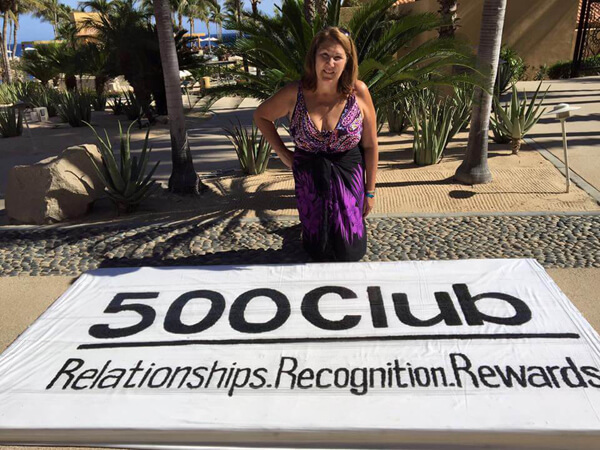 Keep getting out there and get involved in your community so these business owners get to know you, know that you're a reputable travel agent in the area. And then suddenly, that door might open a little bit further because they know you. If you're just doing cold calling, it's a very tough door to open. Steph: That it's great. It is like a depressing number if we say one person, but it isn't depressing if that's what you're preparing yourself for. Steph: People go in with unreal expectations and are thinking, "Oh, I should be hearing back from like 75 people. This is...my phone is gonna be ringing off the hook." Karen: No. And you also have to prepare yourself of what exactly do you think you can handle. If you go to a corporation and they have 400 people that travel every week, can you handle that? That is a lot of phone calls. And you also have to realize with corporate that your cell phone has to be next to the bed because they do have problems in the middle of the night and they get to a hotel and they're oversold, or they get to a hotel and they've had a fire. These are all things that have happened over 35 years that clients call you and they go, "Oh my gosh, I pulled up and there's a fire. What am I supposed to do?" And you get out of your bed and you go open up your computer and you fix it. And you make sure that those clients are taken care of, and then they're gonna go home and go, "Wow, Karen answered the phone at 3:00 in the morning when I arrived late," or whatever. You have to be able to be prepared to fix everything that you can possibly think that could happen when someone's traveling. I mean, it's a whole different world in corporate because they don't want to chitchat with you. They want to call. They want to book their air. They want to book their car. They want to book the hotel, and they want to hang up and get back to their life. Where leisure people, they want to sit down and show you the pictures of their kids, and yeah, it's a very different mentality to work with corporate. They just want you to take care of them, fix whatever goes wrong, and do it again the next time. Steph: Yes. That's a perfect segue to move on to talking about how you balance corporate and leisure. So Hurlbut Travel has roughly a 50/50 corporate/leisure mix, and you started in corporate and then added leisure into the mix which can be challenging since as you mentioned, the interaction with the clients is on opposite end of the spectrum typically when you're dealing with corporate versus leisure. What's it like to do both leisure and corporate? And do you recommend it? What's there to like and dislike about it? Karen: Well, I think the corporate...that's a tough question. So the corporate keeps the bills paid, is what I will say. So because it's a constant revenue, so every week, I can guarantee that my phone will ring with corporate travelers and that will keep a more consistent salary maybe where leisure, you obviously have your seasons. I'm here in Wisconsin, so everyone gets out of town from January through March. So I have a really great paycheck in April, but then it's really slow over the summer. You don't have as many people traveling. So corporate is a constant where leisure is just a push in the winter. Everyone's got their high season. The people with the cruises do the wave season. So there are pushes when it's cold where it's just a different atmosphere. So you're crazy with leisure for maybe three, four months, and then you slowly get paid for it throughout the rest of the year, and even into next year. So we're booking now in February for next December and January, and February, and March. So our charter season is not out yet. That won't come out until May or June, but our leisure cruise and some tour packages, we're booking now into '19. And you get paid in 2019 where corporate, you're getting paid weekly. I think that's the biggest differential, but there's certainly a huge difference between the mentality of a corporate traveler and a leisure traveler. Like I said, the corporate wants to get in, get out, get on their way where the leisure travelers, they want to come in. They want to chat about where they've been before and show you pictures of where they've been before, and they want to take up hours of your time. And it's hard when you come from a corporate mentality like I do that I don't want someone sitting at my desk for two hours to plan a trip. It puts me over the edge. So you learn very slowly that you have to be more patient with leisure travelers and you can't expect them to necessarily make a decision immediately because they want to think about it. Steph: Oftentimes, they're...you know, I think one of the big things is they're spending their own money versus a corporate traveler is often using their company's money and the leisure traveler is often a larger amount that they're spending of their own money, and so that leads to a lot longer lead process. Karen: I would agree. I would agree. And the leisure travelers, you want them to take the time and think about it as well. As much as you'd like to have them come in, book their trip, get out, you don't want your clients walking away wondering if they've got the best vacation. So I would rather talk to a leisure client a couple times and give them options so they feel like they're well-informed. Steph: Now, when we're talking about leisure, you had mentioned...well, you had said...when I asked you about what your admin, some of the different tasks that you have her do, you mentioned that she looks for price matching for your leisure clients. And I think of a really interesting view on that and using the insurance, the cancellation insurance. Would you mind sharing that, your philosophy? Karen: Absolutely. So what my admin does every single Wednesday is she checks prices on cruises on every tour we've booked, anything that has insurance where they're able to get a refund back because they've taken the insurance. So obviously, we push the insurance for that reason, plus they're able to cancel for any reason. But if the price goes down, we send our clients an email going, "Hey, your price went down $80. We will keep looking. Just want to let you know." And the clients are so excited, and they tell all their friends, "Oh my gosh, my travel agent saved me $80 today." So then we check it the next week. And if it goes down, we send them another email, "Hey, your price went down another $40." And they tell all their friends, "Oh my gosh, does your travel agent check prices for you?" And of course, no one else is doing that because people think I'm an idiot for doing that. But it is the best advertising in the world. I mean, I literally have a client, his trip started out at like 1500 a person and ended up at 1100 a person by the time they went. And he sent me this lovely thank-you card in a spa certificate. And I have more referrals from that one client than I can even begin to tell you because yes, we're losing money. Every time their price goes down, we are losing money for sure, but it is the cheapest advertising because this guy is not only happy with his trip but he's so happy that he tells all of his buddies. Steph: Well, I will tell all of the listeners here that you have a raving fan base which Karen is not even aware of. When we were on the phone chatting the other day, I asked her, "Oh, I was looking on your Facebook page and saw you had so many five-star reviews" which is not something...usually I don't see agents with a lot of reviews on their page. "How are you getting all your clients to review you?" And she's like, "There's reviews? Where? How do I find these?" And I'm like, "You have 12 reviews, you have a 4.9-star rating," and she has no idea how this even happened. Karen: I really don't. I am so bad with technology and that's one of the things my admin does. She posts to my Facebook page. We do Where in the World Wednesday. We do Travel Tip Tuesday. I think we do Fun Fact Friday. Those are our three days that we post and just put something out there. I don't try and put a lot of things on Facebook that is financially related. It's not like, "Here's the deal of the day," although we do occasionally. But in general, I like it to be more factual information, things that people can learn about the travel industry. And you try and gain an audience by having that kind of information, but if a client is posting lovely things about me, that's just added bonus. Steph: Well, you definitely have that. Karen: Well, good. I'm glad to hear. Steph: Well, let's move into kind of the continuing...how you continue to learn. So you mentioned on our call that there's always something more to learn which is totally true in our ever-changing industry, and even for someone with 35 years of experience. So one thing to mention to our listeners is that you're one of Travel Planners International's or TPI's top 40 producing agents. 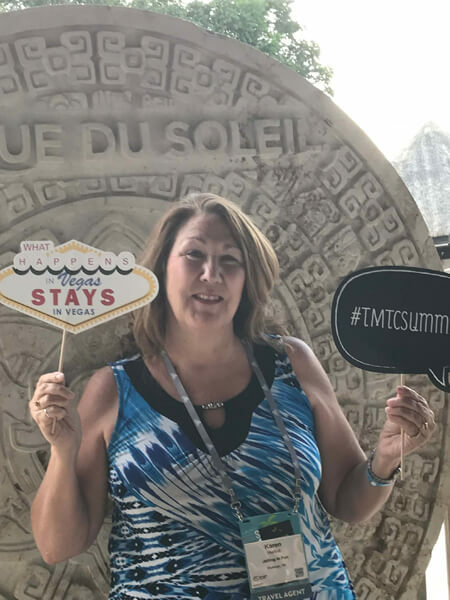 And I know that you mentioned that you're going to be going to a TPI top agent event this summer, and I'm guessing that's where some continuing education and networking with higher revenue agents happens. Is that a correct assumption? Karen: That is a correct assumption. It is. And it's an honor to be part of the TPI family. It really is. There's some great people there, and they have great programs. So for anyone who is new to the industry and needs a little bit more hand-holding, I think they do a great job with many of their programs, whether it be their TPI training down in Maitland, Florida, but they also do webinars and they constantly are doing supplier insights where you can actually sit with your clients and watch a presentation by Viking River Cruises or Carnival or whoever it might be. So they have all that great information out there for agents to take advantage of. It's a great company to work for. I personally...for me. May not be for everyone, it's great for me. But also with the training, we also attend trade shows. I am part of GTM. I went two years ago. I'm going again this May to the GTM West where they invite agents who make a certain amount of money a year. I don't even know what the cutoff is. It might be 800,000 or a million, whatever it is. They invite and they have tour operators that you come and you meet one-on-one with. And you sign up for the ones that you think you'd like to learn more about, and they kind of...the tour companies look at your profile and decide whether they want to talk to you or not, and they try and match you up so you can have conversations that benefit both of you. There's companies two years ago that I had never heard of and found through GTM that I now use all the time that I knew nothing about. And these other events where you go to top 40 events and you're working and talking with other agents who are not necessarily selling like you, they are just selling the same amounts of money as you, and they might be selling completely different things. And you're like, "Oh, who do you use for Ireland or who do you use for Italy?" Whatever it is. And you start making notes and taking advantage of these relationships that you're building with these people that are just so informative because you think you're running your business as best you can, and you're like, "Wow, I'm rocking it." And then you go to these events and go, "Hey, I really don't know diddly-squat. And look what I'm learning from all these other people." So even after 35 years, you have to keep your ears open and realize that you might not be doing it the best way, and that all these other agents are going, "You're really a dinosaur and you need to pull your feet out of the clay and move on," and you learn everywhere you go, every agent you talk to, every tour operator you talk to. You're learning something. Even if you take away one good thing from a conference, it's worth the money. Steph: It's an investment, but even for me when I go to conferences within the travel industry, I'm always learning new things from the agents or the vendors or to the speakers if I'm attending a presentation. It is an investment, but it has paid back so much. Yeah, I love attending events. Karen: They're very good. Some are more based toward newer agents and some are for people who are old like me, but you get something out of everything. You just have to pay attention, and if you feel like you need to know something in particular from a certain vendor that you didn't hear, call them, email them. These BDMs are there to bring in your business to their company. So if you want to know more about Royal Caribbean, find out who your rep is. Call them. Have them come to your home if you're working at home or meet them at a Starbucks or whatever and ask your questions because I think that's how you learn. If you're sitting at home and just wondering about a company, that's not gonna help you. Call them, find out, ask your questions, and be informed. It'll make you a better agent. Steph: Yes. And for those listening, again, we'll link to GTM which is travel weeklies event. It's Global Travel Marketplace. We'll link to that in the show notes. 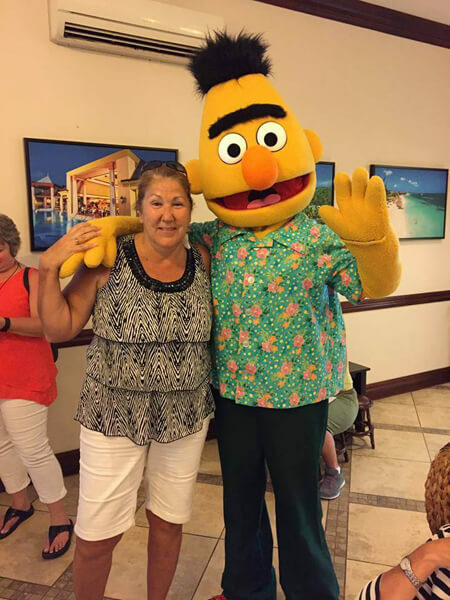 Nothing says warm and fuzzy like a photo with Bert! Steph: Well, all righty everybody, it's time to move into our last segment which is warm fuzzies. Every episode, I ask our guests to share something that they've done or they've seen that has brought a smile to their face or to the face of others. And my hope is that it can brighten your day and maybe inspire people to do a random act of kindness today. So Karen, what do you have for your warm fuzzy to share with us today? Karen: This is my most worrisome moment, Steph. Steph: She was super nervous, everyone, about that. She was very nervous. She was like, "I don't know if I've done anything good." Karen: Well, exactly. What exactly have I done so great in my life that has helped people? I have no idea other than to tell you that I am very active in my community. And when things are not going well, I try very hard to be the one who's stepping up and being there, whether someone has had a flood in their house and you prepare a meal or you drive them somewhere because their car has just blown up or whatever it is. I guess that's the only thing I can say, Steph. Is I try and be there for my community when it is in need of help. Steph: Well, I can tell you that you have been a great help to the travel agent community today by sharing all your insights. I know that...you know, I speak on behalf of a lot of our listeners that they're very thankful that you were sharing your 35 years of experience with them. So thank you for that. Karen: Well, thank you, Steph. I'm glad that I could help. If only one person out there gets something out of our chat, that's a good thing. Steph: They definitely will, and I'm sure you will be hearing from some of them. Steph: You can subscribe to us on iTunes by searching for Travel Agent Chatter. To read a transcript of the show, interviewer show notes, you can visit hostagencyreviews.com/tac. If you like the show, make sure to sign up for our monthly newsletter to get the episodes and other resources straight to your inbox every full moon. "What kind of resources?" You ask? Well, we just created some nifty credit card calculators to help make sure that you have the best business credit card in your wallet. Sign up for our newsletter at hostagencyreviews.com/newsletter. And before we part, we'd love to hear your thoughts on any future show ideas. If you know of an agent that would be great to interview and that includes yourself, drop us a line at hello@hostagencyreviews.com. We love getting email. The only thing that's more fun than email, snail mail. That's all for now, until next time.